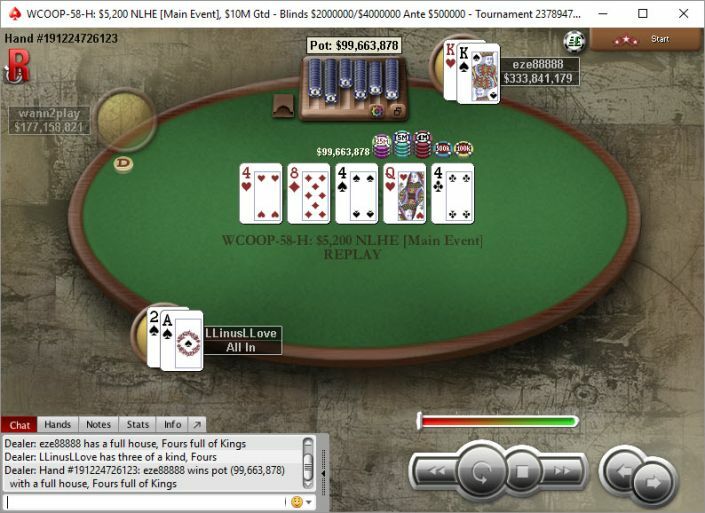 The mysterious pro by the name of Wann2play took down the WCOOP Main Event on PokerStars this morning, walking off with the princely sum of $1,352,967.97 after defeating Ezequiel Ez88888 Waigel heads-up, following a deal that almost went sour - Waigel asking for extra money to pay tips! Despite a great effort, Loeliger had to settle for 3rd spot and $764,501 – and then we were straight to deal time…Argentinian Waigel rather cheekily asking for $18k more than the chip-chop numbers provided, and then when they agreed on $10k, he decided he wanted even more – to pay the tips! … and the match-up was befitting of any Main Event final table – the lead changing hands several times and both all-in and at risk along the way. When the end came, several hours in, it was an increasingly frustrated Waigel who lost out – but he’ll certainly have enough to pay his own tips with the $1,257,203.66 payday! Wann2play deservedly took the lion’s share of the prizepool and the coveted Platinum Pass.